Ecoasis Garden Center | Your source for environmentally friendly landscaping and gardening supplies. Local, Maryland grown Christmas trees, Pointsettas and holiday gifts! Thank you for visiting our web page and we hope to see you soon! We are located at 18301 West Central Avenue in Bowie Md. Just one mile from Rte. 301 from the west and the Patuxent River from the east on the border of Anne Arundel County and Prince Georges County. Ecoasis is a traditional garden center that offers eco-friendly alternatives. 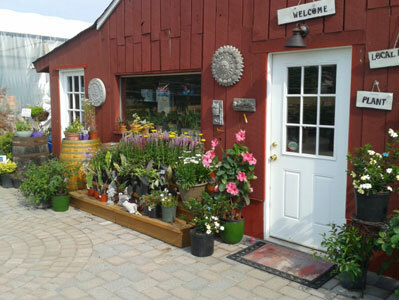 We carry many varieties of native plants, trees and shrubs. We also have in stock sustainable landscaping and gardening products for growing in the Chesapeake Bay watershed. For fertilizing and pest control we suggest using environmentally approved products from Espoma. Our rain barrel and composter selection is great and we can also install your purchase. Most of our annuals and shrubs are plants from local growers such as TSB Enterprises in Lothian, Md., Hall Growers in Upper Marlboro, Md. and Tidal Creek in Davidsonville, Md. as well as shrub and tree growers from the Eastern Shore, Prince Georges County and Montgomery County. The store is stocked with earth-friendly products, rain barrels, composters, eco-mats, bio-logs and much more. Also on site are chickens producing eggs and bees for local honey as well as a large vegetable garden for selling produce and fresh cut flowers. The garden center offers flower and vegetable plants in eco-friendly containers and encourages customers to drop off any plastic trays and pots from purchased plants for recycling. We are actively involved and donate to many area environmental groups such as the River Keepers, Chesapeake Bay Foundation, Watershed Steward Academy, and other local groups. We have a very convenient location for bulk products and stone and carry a wide assortment of natural stone products, pavers and crushed stone, soils, and mulches. Contractor discounts are available. Our Sister company, Ciminelli's Landscape Services offers Free estimates for landscape and hardscape services. 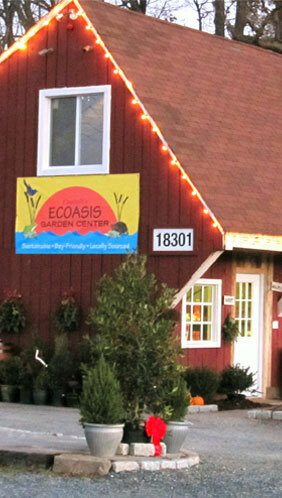 Ecoasis Garden Center is open Monday through Friday 7am – 6pm, Saturday 8am – 4pm and Sunday 9am – 4pm. Please contact us by phone: 301-430-0870 or email: info@ecoasisgardencenter.com. One mile West of the Patuxent River on Central Ave.
Click here for our Farm to Table Products.